Ballpark Estimate: $2,500 to $12,500. It’s all about the fish. Koi pond owners love their colorful fish, the Japanese “living flowers” that are so eager to eat that they make an entertaining spectacle of it at mealtime. Some fish even eat right from their owners hands. Creating a habitat that’s just right for the eager eaters takes money and dedication, whether homeowners decide to do the job themselves or hire professional landscapers. Costs include construction, equipment, fish, maintenance, energy, and food. Deciding to build a koi pond – rather than a simple kit-type water feature or a goldfish pond – is to make a much bigger financial commitment. A goldfish pond need only be a couple feet deep, whereas koi need a depth of four to six feet. Deeper waters prevent a full winter freeze and dissuade predators. Before turning the first shovel of dirt, homeowners should check their local ordinances and neighborhood covenants to find out if a permit or special approval is required. Deep ponds may also necessitate fencing yards to prevent accidental drowning. It’s also important to have utility companies mark the location of underground lines. Investing money into pond only to have others try to force its movement of closure won’t make anyone happy. Location is key. Most homeowners want their pond near the house, but not so close that it can’t be seen from inside the house too. The ideal spot won’t get direct sun all day – which could lead to an algae problem – nor will it be completely under a shade tree. Although trees can provide visual cover from flying predators like the great blue heron, skimming leaves from the pond each day could get tedious. Picking a spot where water normally accumulates doesn’t work well, as fertilizer-tainted rain runoff can upset a pond’s ecosystem. Ponds owners who choose to start off small often regret the decision, since it limits the number of koi they can keep. Ponds that are 12 by 16 feet are popular. Do-it-yourselfers can save money on excavation and ledge building. Professionals typically charge $1,200 and up for the job – depending on size. How homeowners fill the freshly dug hole depends partly on taste and partly on the must-haves of koi ownership. A liner is one of those must-haves and it must be the right size. When measuring, it’s important to include the bottom depth, the ledges, and plenty of space for tucking under rocks. PVC liner is popular, but it may deteriorate over a five-year period. Although it’s more costly, some pond owners choose a thicker, synthetic rubber liner. Other must-haves include a water pump, a filtration system, and an ultraviolet sanitizer. When koi ponds came into vogue a few years ago, there were few equipment suppliers. Now, at least 15 companies supply the market and as competition increased, costs decreased. When comparing equipment, buyers should pay attention to the amps needed to run it, as that will factor into ongoing energy costs. Owners, depending on aesthetics, also need to budget for landscaping rock and plants. Other supplies which vary upon need are piping, drains, specialty skimmers, bubblers and waterfall equipment. Koi don’t mind cold water, but many owners use cattle trough heaters to keep ponds from freezing thoroughly in the winter in cold-weather climates. Others invest in heaters that allow koi to be enjoyed longer into cold weather climates. Koi quit eating when they are colder than 50-degrees, meaning they also slow their growth. Owners who want koi to grow faster may choose to warm the water and continue feeding. Keeping koi can become a happy obsession. There are plenty of local koi clubs and fellow members can be a great source of information – and of fish. Owners may be willing to give or trade fish in order to keep their own ponds in shape and that may be preferable to beginners. Koi come in many colors and varieties and are discussed by sellers in terms of grade. The cheap fish start at standard, premium, and select and get costlier at butterfly, premium B, and select B. Size factors into the cost too. 3-inch koi: $4 and $28 depending on grade. 22-inch koi: $660 to $3,000. Full-size 40-inch koi: online for $2,200 to $14,000. **Trading koi within a koi club can save money. Caring for a pond of costly “living flowers” also means taking steps to make sure they don’t get plucked up by predators looking for a free meal. In addition to great blue herons, kingfishers and raccoons also like a tasty koi treat. Keeping the pond deep will deter the raccoons and some heron. Heron may also be defeated via a look-alike decoy – the thinking being that they might not take a meal from one of their own. There are also nets and wire products to keep the birds out, but they may injure the bird. Ongoing costs include fish food, which is available for $1 to $2 per pound. Koi also eat peas and watermelon. Owners also need supplies to monitor the ammonia and nitrates of the pond ecosystem as they also change five to ten percent of the water each week. If things get iffy and a fellow koi owner can’t lend a hand, owners should factor another $500 for maintenance visits from professionals. 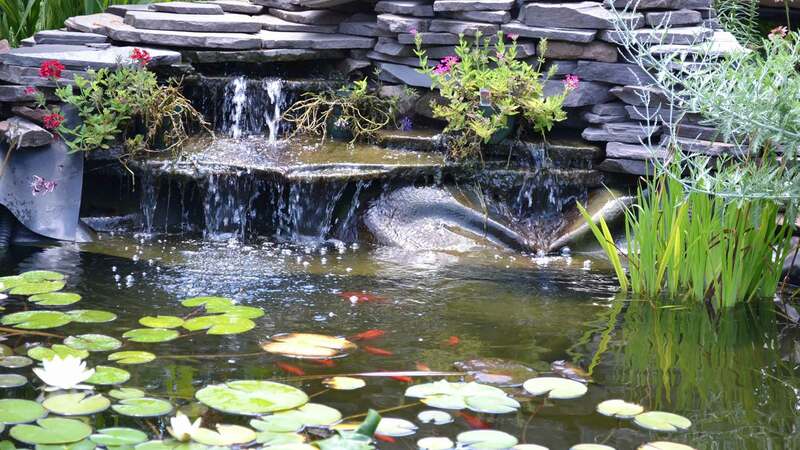 Owning a koi pond becomes a labor of love for those who are truly enthusiastic about the fish. To be successful, homeowners need to plan well and be ready to attend to the biology involved. If kept well, koi can live 30 to 40 years.